 Urquhart's third novel (after Changing Heaven, not reviewed) is an engrossing multigenerational tale shot through with passages of poetic intensity and beauty. On Raithlin, a small island off the northern Irish coast, in the mid-19th century, a young woman named Mary is changed forever by a romantic, tragic encounter. A sailor, victim of a distant shipwreck, is washed ashore and dies in her arms. The islanders believe that the youth is Mary's demon lover who has sent her away to the spirit realm, leaving only her physical replica. In fact, Mary moves about in a heightened state of dreamy creativity, consumed by shimmering visions of the sailor, the sea, and far-off lands she has never seen. She finally agrees to marry Brian, master of a local school, who loves her for her otherworldliness as much as for her russet-haired beauty. With Brian, Mary finds a measure of contentment, especially after the birth of their son, Liam. In 1846, however, the potato crops fail and the family is faced with starvation. With a gift from their British landlords, they emigrate to Canada on one of the notorious ``coffin ships.'' They survive the wracking journey and settle on scruffy farmland in the Canadian north woods. In the deep forest, the pull of the other world begins to reassert itself, and one day Mary disappears, leaving behind seven-year-old Liam and an infant daughter, Eileen. Several years later, an Algonquin named Exodus Crow appears, bearing Mary's corpse and explaining the abandonment of her family. Once grown, Liam and Eileen move south to settle on the shores of Lake Erie, where Liam realizes his dream of nurturing the land on a flourishing and fertile farm. In an echo of her mother's doomed romance, Eileen falls passionately in love with a fiery Irish patriot. The devastating consequences include a political assassination and the birth of their love child, who must be raised by Liam and his wife. 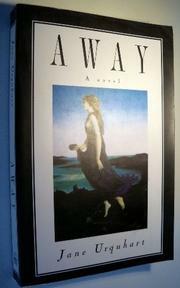 In chronicling one family, Away celebrates the talismanic power of memory and the possibilities inherent in the lyricism and magic that exist just beyond the edges of reality. A novel that is both literary and accessible.